Welcome back to WIP Wednesday! For those of you new to the blog, that means “Work in Progress Wednesday.” It’s the day of the week when I show you what I’ve been working on in my studio. Each week it varies as to what I show you. This past week I spent making & photographing new tutorials that will be released later on in the year. But there’s one very special item that I wanted to show off today. My husband is getting ready to build a deck off the back of our house. Our house is on the border of a huge woods, in fact the back half of our property is nothing but woods. We have all kinds of critters that come into our yard. From the usual raccoons, squirrel, chipmunks, rabbits, birds, deer, coyotes, turkey, & even bears. This new deck will give us a nice place to kick up our feet and relax! I can’t wait until it’s finished (in about 2 weeks). He’s building it himself in his spare time, so it will be a little bit of a slow go, at least at first, but when it’s done … look out. Because of my love of all things furry and fuzzy, we decided to name it “The Terrace at Bear Junction” or “Bear Junction” for short. So now you know why the sign says, “Bear Junction.” But let’s get down to how it was made, shall we? Now it was time to make the background. One of my favorite ways to make a marbled blend is to cut up a whole bunch of clay in the colors I’m going to use. This makes a nice variegated blend. The clay in the top left I used for the grass sections at the bottom. I did the same for the sky portion. Then I simply “tore” the clay sheet in the places I liked and placed it over top of each other for a rustic & lodge-like look. NOTE: I added a thick layer of TLS (Translucent Liquid Sculpey) just before adding the background layer. Some of this the wood will naturally soak up, so make sure you have a thick coat. I them made 2D pine trees of different shapes and sizes. I bent the tops slightly to give it a more whimsical & fun look to it. How boring for trees to go straight up … in my opinion. Then came the fun part. Creating a cute bear that didn’t look like a teddy bear. I think I did a pretty good job. Then was the painstaking part. All those letters. I did them by hand the first 5 times and hated every single letter. I tried script, block, bubble, dots, & cut outs. UGH! I hated them all. They just didn’t look right. Then I remembered that I had stashed an Alphabet Push Mold from Sculpey somewhere. (I was able to find this on Amazon, however I’m not sure that they are sold anymore. Mine is at least 4 years old.) Well … that worked for the most part. After some tweaking and perfecting, as well as adding a wood grain texture, I was pleased. Then I added the final touches … leaf canes, rocks, a honey pot, giant caned butterfly, a deer button, & some millefiori bugs. Then I baked it at 275 degrees for 45 minutes. 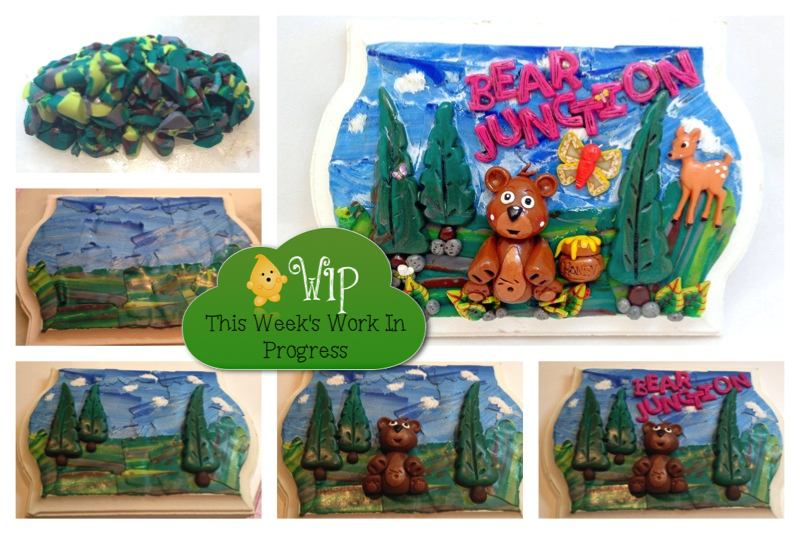 After it was cooled I added a wash of brown acrylic paint to the figurines, trees, rocks, leaves, & grassy areas. I added a wash of white acrylic paint to the sky area as well. To learn how to add an antique effect, see this tutorial. Since this will be hanging outdoors, once it was dry I added 4 coats of Varathane gloss varnish to both the polymer clay and the wood to help seal it. (Let the varnish dry completely between coats, this varnish dries very quickly in about 15 minutes it’s rock hard). NOTE: Polymer clay IS color fast. Even without sealing the colors will hold up but may experience slight lightening due to UV rays as any other plastic would. Once all painting and sealing is done and completely dry, rebake your piece for 20 minutes on 200 degrees to help harden and seal the piece completely. S o excited! Next weekend is the weekend I get to spend claying all weekend with the awesome Christi Friesen & 38 other fabulous ladies. I’m so excited. I even finished my journal (finally) to take with me. This week my cat has decided she can not leave my side … this includes “helping” me work. In addition, I am dog sitting for my Mom & Dad for the next 2 weeks. Tillie is such a fun dog and she wants nothing more than to sleep while I work. So, here she is in my studio … sleeping. I cleaned the most disgusting polymer clay tools that you have ever seen. YUCK. GROSS. I can’t believe how bad they were. And honestly, I’m a little embarrassed by it, but I can’t be the ONLY one, right? See how to clean yours too. If you are in a creative rut, it’s likely because you are afraid to do something new … something that isn’t quite “you” or in your “scope” of technique. I’ve been there too. But when you remove boundaries and allow yourself to try you never know what might happen. I have found this past year that I love caning, and because I’ve dived into it, I’m no longer “afraid” of it. I’ve also learned that I really love making wall hangings too. Though 80% of my work revolves around Parker, there is plenty of work that doesn’t! If I only made cute characters my entire claying career, the chances that I’d get bored are pretty good. So I challenge each of you to try something new this week. If you want to see how I’ve worked “outside my norm,” check out my Polymer Clay Gallery. Love the plaque. Years ago I did something similar (without knowing what I was doing) on watercolor paper. It has held up for 20 years! I didn’t know you could do that on watercolor paper and it would hold up! That’s so awesome Debbie. Don’t you love it when things surpass your expectations?